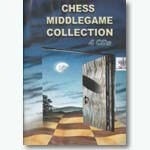 This is a unique set of programs produced on 4 CDs, where four chess programs on the middlegame are put together (Encyclopedia of the Middlegame I, Encyclopedia of the Middlegame II, Encyclopedia of the Middlegame III and Encyclopedia of the Middlegame IV), covering the theory and practice of the middlegame for each of the openings. Each of the four programs includes detailed theoretical material for the corresponding openings and variations, positions for solving and special learning positions to play against with the built-in game engine. In the four programs you'll find detailed material on the theory and practice of playing the following openings: Ruy Lopez, Two Knights' defense, King's gambit, Italian game, Evans gambit, Scotch, Petroff defense, Sicilian defense, French defense, Caro-Kann defense, Scandinavian defense, Pirc-Ufimtsev, Alekhine's defense, Queen's-Indian defense, Queen's gambit, Queen's Gambit Accepted, Slav defense, Modern Benoni, Gruenfeld defense, English defense, King's Indian defense, Nimzo-Indian defense, Reti opening, Old Indian defense, Catalan, Benko Gambit etc. The complexity of the exercises grows inside each theme from beginner to advanced chess player. Individual ratings are calculated on the basis of the user's performance and statistics are gathered for each user. When studying each theme step by step, you can master all the methods and improve your play drastically. Multiple user profiles are featured with independent ratings and statistics for each. Printing options are also available. IBM-compatible PC, 32 Mb RAM, Hard Disk 100 Mb of free disk space, Windows 95/98/2000/NT/ME/XP/Vista. CD-ROM drive. No additional software is required.